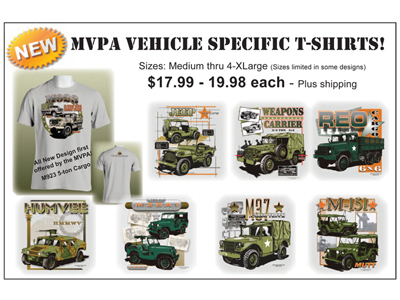 Now in stock in the MVPA Supply Room, a new series of t-shirts featuring iconic military vehicles on the front, and on the rear, the Association logo. Show off your favorite military vehicle - and your favorite club! MVPA members qualify for special introductory pricing, log in to see the member price - or non-members, simply buy at our already great price.